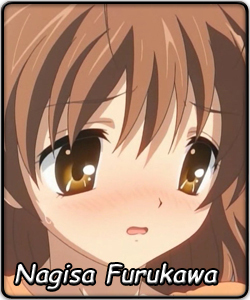 Nagisa Furukawa is a girl who wanted to act in the Theater club, yet she had no prior experience. She has been sick often in the past, therefore her participation in club activities is roughly none, and she even had to repeat a year in high school. Now a third year student, this is her last chance to do a school play. However, she finds out that the theater club in her school has been disbanded, and so fights to reinstate it and recruit enough members to perform her play. Tomoya Okazaki, the male lead with too much free time, goes on a quest to help her attain her dream. This can prove to be a difficult task for Tomoya, since Nagisa lacks self-confidence and she often needs help to motivate herself for a good part of the story. She is a timid "iiko" (good girl) with a happy (but a little eccentric) family life. Her lively parents run a bakery below their home where she helps out at times. She sticks around Tomoya to help him assist others as he helps her achieve her dream. A passionate enthusiast of Dango Daikazoku (a children's show), she is often lost in her thoughts while singing its theme song or tries to introduce Dango Daikazoku themes into everything she does, e.g. her theater club poster. Nagisa manages to tame the wild Tomoya who has a track record of being a rebel, and she is currently a strict chaperone whom he somehow can't disobey. She lets out tears easily when she gets emotionally moved, often relying on the comfort of others to calm her down. Nagisa's whole theater club was actually invited to participate in this contest by none other than SOS-dan's Haruhi Suzumiya (Suzumiya Haruhi no Yuuutsu). Although Nagisa has been very shy, she was eventually convinced by Tomoya Okazaki to give it a shot. With seventeen slots open and many of the stronger competitors already exempt, the whole theater club, Nagisa included, was able to include all five members in this competition, with Nagisa taking 5th place in the Preliminaries over all. While she still doesn't understand the concept, Nagisa wants to take this opportunity to build on her confidence and hopefully do her best. However, if she is as good as everyone says she is, she may be a sleeper to take the International Saimoe League Tiara.